India were seven wickets from their first series win in Sri Lanka since 1993 after Rohit Sharma, followed by lower-order contributions, all but batted Sri Lanka out of the game. The other Sharma, Ishant, having faced a barrage of bouncers from Dhammika Prasad and aggression from Dinesh Chandimal when he batted, came out pumped up and knocked out any thoughts of the target of 386 being chased down with two wickets in his first spell, including that of Chandimal, who had made slight physical contact with Ishant in India's innings. It is conjecture if the altercations contributed to Ishant's hitting the good lengths, but it wasn't probably wise to expose him to the Sri Lankan bowling. Even at P Sara, India perhaps delayed the declaration and ran the risk of injuries to new-ball bowlers. Sri Lanka were obviously going to bounce them to serve the dual purpose of slowing the scoring down and delaying the declaration, and possibly eliminate the bowler. Prasad, the bowler here, was himself not done any favours: he was hit on the left glove the first ball he batted and had to retire hurt. With a lead of 380 in the bag, against this Sri Lankan batting, and with rain always a factor, India would have been expected to declare early in the final session of the day. Still Ishant came out at No. 11, and was bounced and stared at. Except that one of those bouncers was a big no-ball. Ishant didn't like it, and when taking a single pointed to his helmet, as if to tell Prasad to aim at his head if he means to hurt him. 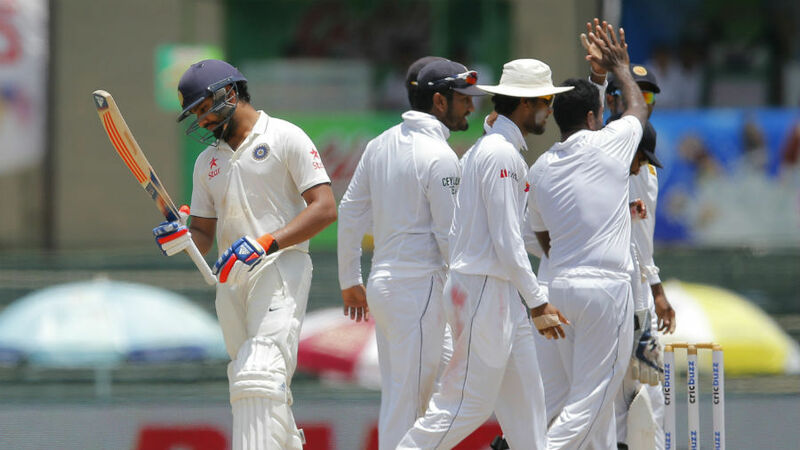 Chandimal made himself a party to the altercation, and seemed to brush Ishant while doing so. R Ashwin, who had batted as stylishly as Rohit but under considerably less pressure, tried to shield Ishant and opened the face to the last ball of the said over, but only managed an edge to end the innings. Ishant ran off to prepare to bowl in 10 minutes' time, but Prasad left his team behind and chased him and caught up with him at the end of the players' tunnel at SSC. The duo had to be separated. All these bursts of energy from Sri Lanka were sudden on a day they were, more than anything, found wanting physically. It will please Virat Kohli, who has often seen - even when not captain - his bowlers come out second-best physically after competing for long periods of time. India had their lucky breaks - the rain on third evening when in the middle of a collapse the last of those - but they showed less wear of three back-to-back Tests than their hosts did. On an oppressively hot day in Colombo - players were often seen fielding with ice-filled kerchiefs around the back of their necks - despite a seaming pitch on offer, Angelo Mathews bowled only six overs out of the 76 India faced, 19 out of 176.1 in the match, which meant little back-up for the two frontline quicks. Spinners bowling 34 overs on this pitch turned out to be easy pickings for India. On the third evening, Sri Lanka rode the momentum to reduce India to 7 for 3, and were looking at just one big push in the final hour before putting their feet up. On the fourth morning, they were looking at a long hot day, and couldn't risk over-bowling anyone. India also had that 111-run first-innings lead, which meant almost every boundary resulted in a retreat from Sri Lanka. Having said all that India would still have been pleasantly surprised to see Rangana Herath bowl the sixth over of the day, only the 14th of the innings. He also carried with him the baggage of the six Rohit had hit him for on the third evening. He began with long-on and long-off back, and just like that India could pick risk-free singles, four of them coming in his first over. Herath's first spell of 4-0-16-0 let India get into accumulation mode, but Kohli welcomed Nuwan Pradeep back with a trademark push wide outside off - high risk for a shot that doesn't produce runs if executed perfectly - saving the TV production truck the bother of cutting fresh replays of the dismissal. They could just go to the last innings' replays. Rohit, though, kept driving beautifully and pulling emphatically whenever he got the opportunity. His two driven boundaries in the 25th over, shots played away from the body, were not free of risk, but at least he was going for runs. And he executed them perfectly. Binny at the other end enjoyed a charmed life in a quick 54-run partnership with Rohit. Sixteen of his first 29 runs came off edges, he was hit on the head once, and a stumping opportunity was missed by wicketkeeper Kusal Perera when on 25. Still, when he edged away for his second boundary, such was the scoreboard pressure on Sri Lanka they responded by taking a catching man out to deep point, where Binny took an easy single next ball. Just when India were moving fast into an impregnable position, Rohit - as he has often done in his Test career - fell close to an interval. This, though, wasn't an out-and-out bad shot. He had scored runs earlier off the pull, but this time a little extra bounce from Prasad took the top edge for long leg to take it and keep Sri Lanka in the game. When they came back after lunch, Sri Lanka didn't seem to have enough left in them to keep staying in the game. India got gentle spin off which they could pick easy ones and twos at one end, and tiring quicks at the other. Binny and Ojha added 42 largely trouble-free runs before Ashwin and Amit Mishra put together 55. Sri Lanka seemed resigned to batting only when India wanted them to, and Ashwin took the opportunity to play some graceful shots in his first successful innings with the bat. What followed between Prasad and Ishant, and Chandimal and Ishant wasn't as graceful, but might have been enough to warm Ishant up. Yet again Ishant produced Upul Tharanga's edge in the first over, taken this time of course, to keep to 71 the total runs scored by the first wicket on either side in 12 opportunities. Ishant and Kohli were now in the face of the dismissed batsman, but Yadav was less angry when he got an edge out of Dimuth Karunaratne soon. Ishant's anger boiled over when he got the counterattacking Chandimal to open the face to play a short ball to third slip, where KL Rahul dropped yet another catch only for Kohli to take the rebound. Ishant repeatedly banged his head without getting close to Chandimal. This was a better way to send the message across. More importantly he was in line for a 10-wicket haul and - if India finish the job here - a big role in two if India's last three Test wins.